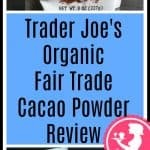 The pros: Trader Joe’s Organic Fair Trade Cacao Powder is new to shelves as is Trader Joe’s Maca Powder. This is rich and has solid chocolate flavor. Let me deal with the first point of confusion. 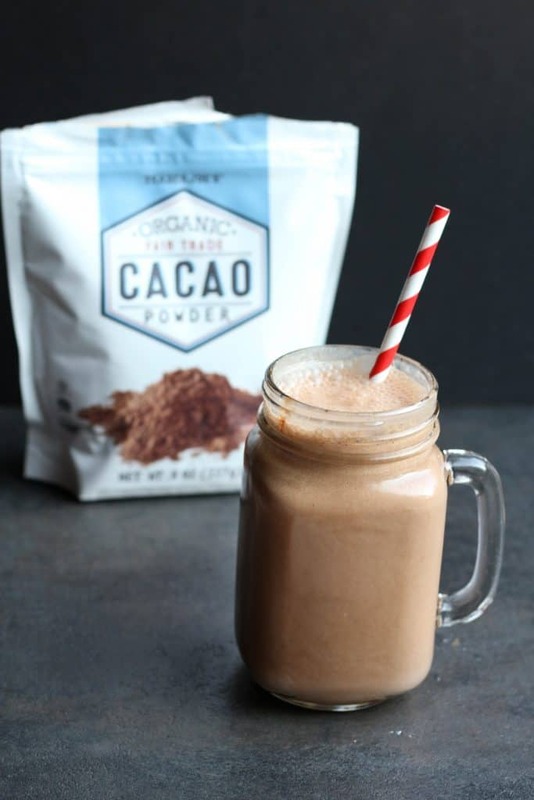 When I first started to draft this post I spelled this item as “cocoa” thinking that it is the same thing as “cacao.” However, further research says while they are similar there are stark differences beyond just the simple spelling of this item. According to Chowhound “Cacao is essentially the purest form of chocolate that you can eat. It is an excellent source of antioxidants, fiber, monounsaturated fats, and contains high levels of magnesium.” When comparing that information against the nutritional label, there is a decent amount of fiber and some other nutrients register with a serving size of just one tablespoon. Now, this isn’t the type of thing you eat straight from the bag. Regardless of whether you keep cocoa or cacao in your home, they can be used interchangeably. 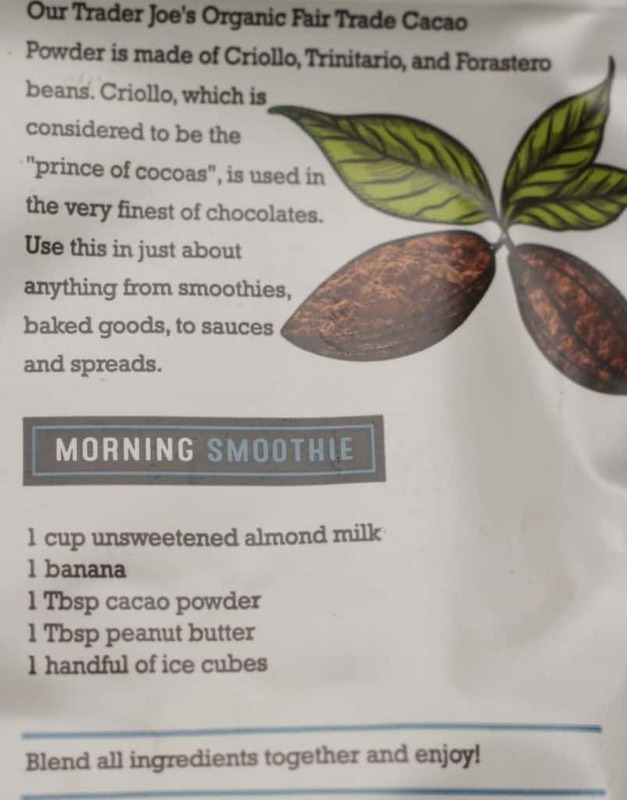 I chose the path of using the smoothie recipe included on this package. The smoothie recipe was delicious. It reminded me of a peanut butter cup flavored smoothie without the added sugar and with a banana taste thrown in. The smoothie actually made me feel full until lunch which I was a bit surprised about. One tablespoon only added 20 calories and two grams of fiber. I’m sure there are lots of other chocolate smoothie recipes out there, but the recipe on back is a starting point on which to experiment. In just one tablespoon it was added a rich chocolate flavor. As for the bitterness, it was a bit harder to decipher as almond milk and bananas add their own sweetness. One tablespoon was more than enough to flavor a milk shake richly. I would really consider adding more than that. Would I bake with it? Yes, absolutely. Have I tried that yet? Not yet. But it is on the list of things to do with the resealable bag. For $3.99 for 8 ounces, this isn’t cheap but you are getting all the buzzworthy elements: organic, fair trade, and cacao (not cocoa). Would I buy this again? 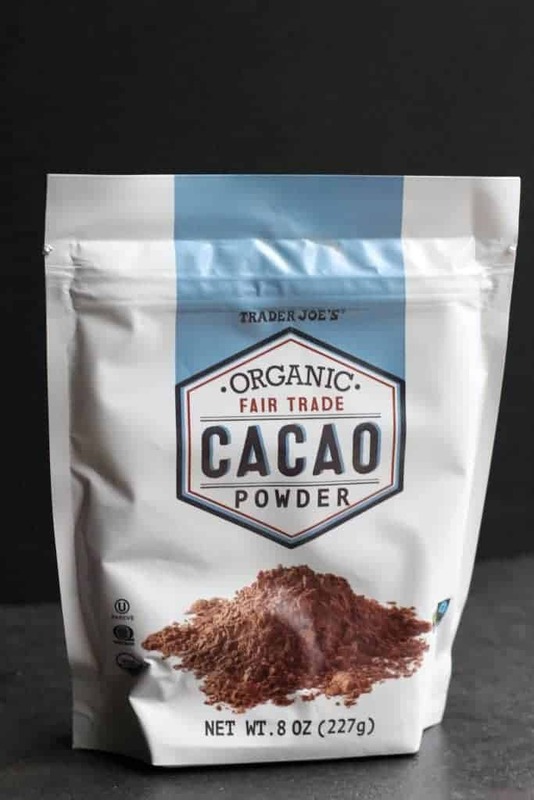 Yes, if I run out of cacao powder then I would reach for Trader Joe’s Organic Fair Trade Cacao Powder again. However, using this 1 tablespoon at a time, it might be a while before I need to buy it again. Great review. But how did you get this before me??? Hey Tim! Its been on my local Trader Joe’s shelves for 2 weeks. I’m on the east coast so maybe that has something to do with it. I found it in the new products endcap. For the longest time I was confused by cocoa and cacao 🙂 this looks really good though. I am wondering if it’s made in a facility with nuts….if it’s made by trader jos, I think it does have the cross contact risk. hrm. Thanks for posting! I looked over the bag and there was nothing mentioning any allergy information on my bag. I’m not sure of what guarantee that is that some cross contamination didn’t happen, but as far as packaging there were no allergy warnings. I hope that helps at least somewhat. There are no dumb questions on here and you are always welcome to stop by, share or ask questions. But at the end of the day, I’m not a food scientist and can’t give you a guaranteed answer to your question.